This virtual historic tour around the Bargate Area of Christchurch to the North of the Christchurch By-pass will give an indication of buildings outside of the Saxon Burgh, along with the Pound, Bargate and Brewery House visited on the High Street Historic Walk. 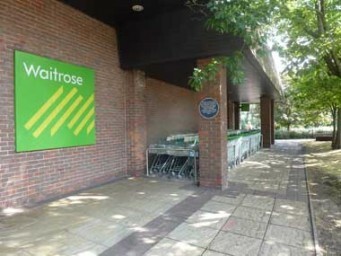 The tour starts from the Waitrose Car Park, which can be accessed from the Christchurch Bypass. 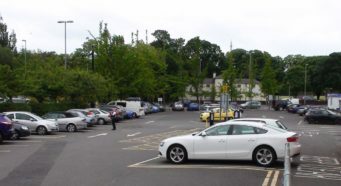 By walking across the Car Park outside of Waitrose and looking back to the Car Park you are viewing the Saxon Cemetery. We are looking at the car park where the pagan Saxons had their cemetery. 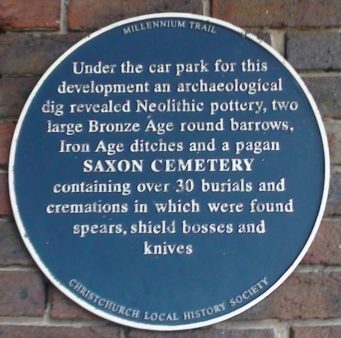 When Saxon shield bosses began to be dug up the excavation was extended to find :- Neolithic pits; two ploughed out Bronze Age Barrows; and pagan Saxon graves orientated around the Barrows. The graves of women with brooches and men with spears, shields knives were of the sixth century but no skeletons survived because of the acid soil -only black stains of their outlines. The Red House Museum has a full-sized reconstruction of one of the graves, its occupant, and some of the weapons found. On the Christchurch Blue Plaques Millennium Trail Leaflet1 this location is identified as number 4. This road junction is where Christchurch Bypass, Bargates, High Street, and Barrack Road meeting and in times gone by a populated area known as Pit which suffered a major fire in 1826 that destroyed many houses, Spicer Street, Silver Street, and Pound Lane (which is visited on the High Street Historic Walk) were created during the rebuild. On the traffic refuge as you cross Bargate stands a Fountain to commemorates Samuel Bemister who was five times Mayor and died in 1900. 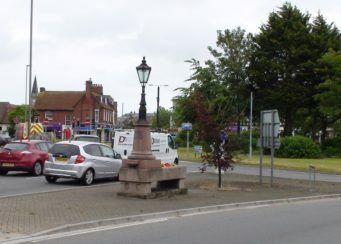 The fountain used to stand where Fountain Roundabout now is, giving the roundabout its name. It was moved to Quomps when the by-pass was built but is now back by the Assembly Rooms opposite at Bargate. The fountain had facilities to provide water to horses and dogs as well as thirsty passers-by. On the Christchurch Blue Plaques Millennium Trail Leaflet1 this location is identified as number 2 but no Blue Plaque has been erected. The big traffic island here, known as the Fountain Roundabout, is a consequence of the modern by-pass. Before the Bypass was built the location of The Bargate (which is visited on the High Street Historic Walk) and the road by its name were not segregated as they are today. The Pit Car Park beyond and the Fountain Roundabout now occupy what was in the 18th to 20th Centuries the most congested area of the town, packed with little cottages, most of which would have been thatched beer houses and workshops together with the three storey tall Antelope Inn, and a Cross Keys Inn, and a road called Spicer Street behind them. The thatched houses were burnt in a great fire which destroyed over fifty of those humble homes leaving many homeless in Georgian times. It was not long before they were rebuilt, but they were all swept away again by the 1950’s in a slum clearance and road building programme. The car park beyond the Fountain Roundabout is at The Pit Site, a former gravel pit. 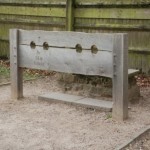 Once the Town Jail, called the Blind House, was relocated here from the Old Town Hall, where it got its name as it had no windows, together with a pair of stocks. On the Christchurch Blue Plaques Millennium Trail Leaflet1 this location is identified as number 1 but no Blue Plaque has been erected. Beyond the Assembly Rooms is The Fusee, a former fusee watch chain factory, one of three which once existed in the town in the 19th Century. 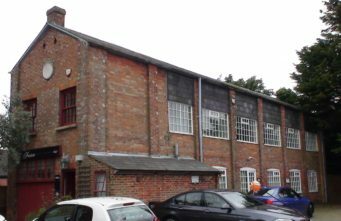 This is almost certainly the last purpose built fusee chain factory anywhere. Notice the roundel under the eaves with the date and name of the factory. The fusee chain industry is discussed elsewhere on this website. On the Christchurch Blue Plaques Millennium Trail Leaflet1 this location is identified as number 3 but no Blue Plaque has been erected.